Will The Real CJI Dipak Misra Stand Up?How Will History Judge Him? "A man has as many social selves as there are distinct groups of persons about whose opinion he cares. He generally shows a different side of himself to each of these different groups", William James, American Philosopher & Psychologist. Chief Justice of India Dipak Misra is demitting office after a tumultuous tenure, leaving behind a mixed legacy. Over his judicial career, CJI Misra was seen stating different things at different times, often contradictory to each other, lending credence to the theory that an individual is a colony of different selves. "Be it stated, a time has come, the citizens of the country must realize that they live in a nation and are duty bound to show respect to National Anthem which is the symbol of the Constitutional Patriotism and inherent national quality. It does not allow any different notion or the perception of individual rights, that have individually thought of have no space. The idea is constitutionally impermissible"(emphasis supplied). While ordering compulsory playing of national anthem in cinema halls, Justice Misra said that individually perceived notion of rights are not permissible. Cut to 2018, we see CJI Misra offering paeans to individual autonomy and uniqueness in Navtej Singh Johar case, in a turnaround from the original position that individually perceived notion of rights was not constitutionally permissible. "Irreplaceability of individuality and identity is grant of respect to self. This realization is one‘s signature and self-determined design. One defines oneself. That is the glorious form of individuality. Autonomy is individualistic. It is expressive of self-determination". "The question would be whether the dramatist can contend that he has used them as symbolic voices to echo the idea of human fallacy and it's a creation of his imagination; and creativity has no limitation and, therefore, there is no obscenity. But, there is a pregnant one, the author has chosen historically respected persons as medium to put into their mouth obscene words and, ergo, the creativity melts into insignificance and obscenity merges into surface even if he had chosen a "target domain". He in his approach has travelled into the field of perversity and moved away from the permissible "target domain", for in the context the historically respected personality matters". Using similar arguments, his judgment in 2016 upheld the constitutionality of criminal defamation under Section 499/500 IPC. "A creative work has to be read with a matured spirit, catholicity of approach, objective tolerance and a sense of acceptability founded on reality that is differently projected but not with the obsessed idea of perversity that immediately connects one with the passion of didacticism or, for that matter, perception of puritanical attitude. A reader should have the sensibility to understand the situation and appreciate the character and not draw the conclusion that everything that is written is in bad taste and deliberately so done to pollute the young minds. On the contrary, he/she should elevate himself/herself as a co-walker with the author as if there is social link and intellectual connect"(emphasis supplied). An evaluation of his judicial career will show Justice Misra de-constructing and reconstructing his dispositions to assume the role of a fierce protector of individualism and liberties, mostly during his tenure as the CJI. Certainly, it is a sign of robust intelligence that one is able to act freely as per demands of the situation, contradicting and varying one’s own previously held views. That is why Oscar Wilde once famously said, "Consistency is the last refuge of the unimaginative". Is this transformation a result of pure shift in thought or due to extrinsic factors? In this context, it is relevant to refer to the narrative that the liberal mantle adopted by the Supreme Court in mid-eighties was its atonement for the sins of emergency. It is said that Justice P N Bhagwati’s somersault as a liberal crusader of social justice was mostly impelled by his need to expunge the image as someone who succumbed to the executive will during emergency, particularly in the ADM Jabalpur case. Are there similar parallels in the image makeover of Justice Misra? Justice Dipak Misra’s tenure as CJI from August 28,2017 will be marked as one of the most volatile phases of the Supreme Court. He would wish to obliterate a lot of events during his tenure from pubic memory, as they are unsavoury to his image. The most damaging is the “medical college bribery scam”, which surfaced following CBI arrest of Justice I M Quddusi, retired judge of Orissa HC, on the allegation that he accepted bribe to fix a case concerning medical college of Prasad Education Trust at the Supreme Court. The issue got aggravated when it was known that CJI Misra had headed the bench which dealt with the matter. Two petitions were filed in the Supreme Court – one by CJAR & other by Advocate Kamini Jaiswal- seeking an SIT probe into the allegations. A division bench headed by Justice Chelameswar termed the allegations “grave and serious” and referred the matter to be decided by a bench constituted by five senior-most judges, excluding the CJI. On November 10, the very next day, this order passed by the two-member bench headed by Justice Chelameswar was annulled by a hurriedly formed Constitution Bench led by CJI in a raucous hearing session marred by unprecedented drama. This was the fastest ever Constitution Bench constituted in the SC history, with notice about sitting at afternoon published only at noon. Initially, a bench of seven judges was supposed to hear the matter; later, the composition was reduced to five judges, for reasons inexplicable. This marked the beginning of “Master of Roster Controversy”. The annulment order of November 10 was passed by the five judges bench headed by CJI on the ground that CJI was the “master of roster” and hence a division bench headed by the second senior judge could not have constituted a bench to hear the matter. The question whether CJI could constitute a bench to consider a matter concerning allegations against the CJI himself was conveniently left unanswered by the November 10 bench. The unusual order passed on November 10 led to debates on the role of CJI as the “master of roster”. Many in the legal field feel that these events acted as a catalyst for the extra ordinary press conference of Justice Chelameswar, Justice Gogoi, Justice Lokur and Justice Kurian Joseph on January 12. During the news conference, Justice Chelameswar said that the administration of the Supreme Court is not in order and many things which are less than desirable have happened in the last few months." Justice Chelameswar said: "We owe a responsibility to the institution and the nation. Our efforts have failed in convincing CJI to take steps to protect the institution." "There have been instances where cases having far-reaching consequences for the Nation and the institution had been assigned by the Chief Justice of this Court selectively to the benches “of their preference” without any rationale basis for such assignment. This must be guarded against at all costs". 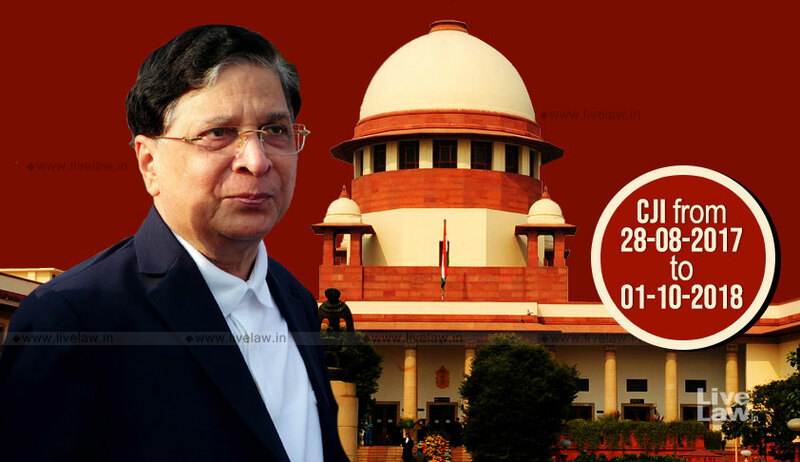 CJI Dipak Misra is the only CJI so far to have faced the threat of impeachment motion. Seventy one opposition MPs of Rajya Sabha moved an impeachment motion against him, over allegations of medical college bribery scam, misuse of ‘master of roster’ power, manipulation with orders issued on administrative side, and also an old case related to furnishing of false affidavit seeking land assignment from Orissa Government. The impeachment motion was rejected by Rajya Sabha Chairman at the threshold. The petition filed against the rejection motion was listed before a bench of five judges of SC. It was not clear who constituted the bench, and how a bench of five judges happened to be constituted at the first instance to hear a fresh petition. The petition was withdrawn after the petitioner’s counsel Kapil Sibal declined to make submission before the five judges’ bench without obtaining clarity as to how the bench happened to be constituted. It is also widely felt that during his tenure CJI Misra was not standing up to the undue pressures exerted by the executive in the administrative affairs of judiciary. There was an instance where the Central Government was making interference with the appointment of a judge to the Karnataka High Court, bypassing the SC collegium. The issue got highlighted only when Justice Chelameswar wrote a letter condemning the government interference, and called for a full court meeting to discuss the issue. Repeated over-turnings of SC collegiums’ re-recommendations by Central Government was a regular fare during his tenure. Though the re-recommendations are binding on the Centre, many of them were ignored. Chief Justice Misra acted pliant, even in the face of such brazenness. When the recommendation of Justice K M Jospeh was returned by the Centre, through an unprecedented act of splitting up of Collegium recommendations, firm reactions were not forthcoming from the CJI Misra. One may recall the strong stand taken by former CJI R M Lodha, when similar attempts were made by the Centre with respect to recommendation of Gopal Subramaniam. With regard to Justice K M Joseph, CJI Misra did not act promptly to reiterate his name, and adjourned the resolution on several occasions. After high suspense, Justice Joseph's name was recommended in August 2018, but along with two other judges, leading to an avoidable fiasco over his seniority. He also could not resolve the stalemate over finalisation of Memorandum of Procedure for appointment of judges. While previous CJIs like Justice Lodha, Justice Thakur, and Justice Khehar have been very active in voicing concerns about delay and interferences in judicial appointments, CJI Misra cannot be perceived as someone who actively addressed exceeding executive interference. Under his tenure the SC Collegium has been biting the bullets of repeated executive snubs, sending disconcerting signals about judicial independence. At the same time, CJI Misra will be remembered for his initiative for publicising collegium resolutions and. bringing in semblance of transparency in collegium meetings. Chief Justice Misra will be certainly remembered for many of his progressive judgments on individual liberties and free speech. CJI Misra’s judgments in Hadiya and Khap Panchayat cases unequivocally state that religious or societal forces do not have any say in an individual's choice of partner, emboldening an individual to love and marry a partner of his/her choice, defying societal and communal pressures. His judgment in Navtej Singh Johar struck down Section 377 of IPC to hold that love should not be circumscribed by gender. In the judgments declaring the right to die with dignity and also in the verdicts decriminalising homosexuality and adultery, he expounded the theme of “individual autonomy”. That constitutional morality should guide governance was held by him in the AAP vs Delhi LG case; and that constitutional morality will supersede cultural morality was held in the Sabarimala case. His judgments in Padmavat, Priya Warrier and Meesha cases reaffirm the guarantee of constitutional protection to creative liberties from perceived offences felt by groups of people. He should be credited for affirming the transformative nature of Constitution which seeks to transform societal mores in tune with constitutional morality. CJI Misra’s deep concern for the protection of rule of law can be gathered from his guidelines against mob lynching and public vandalism. There is a consistent thread of jurisprudence rooted in Constitutional Morality running through all these decisions. Certain institutional reforms heralded by CJI Misra are noteworthy. He took the decision to publicise collegium resolutions, and to upload them in SC website, to change the opaque nature of collegium meetings. Also, he stopped the practise of 'mentioning' by Senior Advocates, and ordered that it should be done only by Advocates on Record, as per their turn in queue. These decisions show that he is open to change. He also took the decision to permit carrying mobile phones by journalists for live reporting. The decision taken by the bench presided by him to allow video telecast of court proceedings is also a ground breaking reform. In this context, it may also be noted that it was the bench presided by him which ordered that FIRs should be uploaded online by police. Debatable Judgments In Politically Sensitive Cases. While CJI Misra should be commended for his progressive judgments and institutional reforms, it is tough to say whether similar zeal was exhibited by him in cases involving political stakes of the ruling front. The major examples are the Loya and Bhima Koregaon cases. The grievance regarding allotment of Loya case was one of the reasons which triggered the judges’ press conference. The Loya case was later withdrawn by the CJI to his own bench from the bench headed by Justice Arun Mishra. The judgment in Loya case, authored by Justice D Y Chandrachud for the bench headed CJI Misra, left gaping holes of unanswered questions and will remain a low point in the Indian judicial history. In the Bhima Koregaon case, CJI Misra concurred with the judgment authored by Justice Khanwilkar to turn down plea for SIT probe. However, the majority judgment has several blindspots as it fails to address many relevant issues which were considered by the strongly worded dissent of Justice Chandrachud. Both the Loya case and Bhima Koregaon case are the ADM Jabalpur moments of modern day SC. CJI Misra, who is otherwise voluble and proactive in cases concerning civil liberties, chose to maintain inscrutable silence in these two cases. Some of CJI Misra's actions in interfering with orders passed by other Division Benches border on judicial impropriety. On 27th October,2017, a Division Bench comprising Justice A.K Goel and Justice U.U Lalit sought the Government’s response, in a petition filed by R.P. Luthra, regarding the steps being taken to finalize the MoP to appoint judges. R.P. Luthra’s petition, later, did not get posted before the same Division Bench that heard the matter first; instead, it was posted before a three judge-bench presided by the CJI. Even the hearing date fixed by the earlier DB was advanced. The CJI-Bench dismissed the matter, recalling the order passed by the Division Bench on 27th October. The manner in which the CJI's bench dealt with Section 498A matter is contrary to usual procedure. When a PIL seeking appointment of women members in the Family Welfare Committee proposed by the Division Bench in Rajesh Sharma case was mentioned before the bench of CJI Misra, he expressed disapproval of Rajesh Sharma guidelines, and sought to revisit them in a 2015 PIL filed for strict action under Section 498A IPC. The proceedings were in effect an intra-court appeal against Rajesh Sharma directions. Though the ultimate result of the process - annulment of directions in Rajesh Shamra constituting Family Welfare Committees to scrutinize domestic violence complaints- was widely lauded, the process in which the same was done fails to meet standards of propriety. The results of the liberal-progressive narrative launched by CJI Misra through his vision of transformative constitution are certainly welcome. However, the controversial background of his judicial career makes one wonder whether it was a strategy for an image makeover, as attempted by the likes of Justice Bhagwati. A careful examination of the bench composition of the Constitution Bench makes one wonder whether the composition was contrived to force intended results. For example, the benches which dealt with Section 377, Section 497 and Sabarimala cases had Justice Nariman and Justice Chandrachud, who are known to have liberal views. The Aadhaar bench had Justice A.K Sikri and Justice Ashok Bhushan, who had upheld PAN-Aadaar linkage in Binoy Viswom case earlier. Justice A M Khanwilkar, who is known to be a passive supporter of CJI Misra, was a common presence in all these benches. The reasons for omitting Justice Nariman, or Justice Bobde and Justice S K Kaul ( who had shown a fine grasp of technical issues related to internet privacy and data protection in Puttuswamy case) from Aadhaar bench are not known. It is also mysterious why Justice Chelameswar, who was part of the original bench which heard the Aadhaar matter and also the privacy case, was not part of the bench which ultimately decided the issue. Deep probe of these questions are blocked by the declaration made by the bench of CJI that CJI is an institution in himself, who has complete powers to constitute benches as the master of the roster. So how will history remember CJI Misra? As a CJI on whom no-confidence was expressed by an open rebellion of four senior judges? Or, as a CJI who heralded a liberal-progressive narrative of constitutional morality and individual autonomy? As a CJI who faced allegations of bribery, mismanagement of SC administration and arbitrary allocation of cases of political importance and threat of an impeachment motion? Or, as a CJI who acted on the transformative vision of constitution to reform social mores and norms superseding conventional morality? As a CJI who did not impinge on the interests of ruling front in politically sensitive issues, and gave elbow room for the executive to meddle with judicial appointments ? Or, as an erudite CJI with deep knowledge in all branches of law who was worked round the clock industriously to pen several landmark judgments to protect free speech ,creative liberties and rule of law? Since it is a tough call to make, one can only go by CJI Misra’s quote of Goethe in Navtej Johar judgment : "I am what I am, so take me as I am".